I had uploaded the photos to Ravelry before I lost all my photos (October 2009-April 2010 are gone), so I swiped the pictures from there -- they were taken right before gifting on Christmas eve, I believe. This one, for the pastor of our church, Father Kevin, is the Classic Ribbed Hat, knitted up in Malabrigo Twist ("Paris Night" colorway -- which I love.) It's classic and understated, just like this man who is so very important to our family. (It's also a little darker than it looks in the picture). I was totally inspired by this hat and neckwarmer set by Shelley. I really liked the elegance of the navy blue, so that's what I went for for Father Kevin. (Our priests wear their black clerical clothing most of the time, but they also wear ordinary street clothes, too, so I didn't feel limited to black for them.) 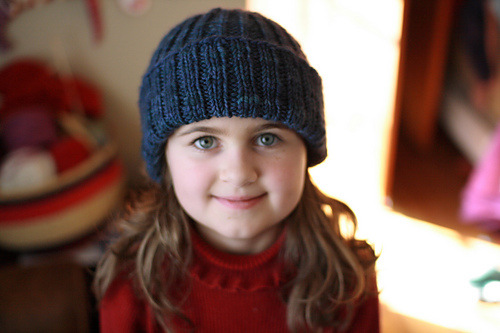 I did most of the knitting on this hat the weekend that my husband graduated from his doctorate -- even during a movie we went to -- and I loved its ease and simplicity. Perfect, I think. The second one was for the parochial vicar that we had at that time, Father Peter. He is actually no longer at our church, as his term ended in June. Our family was very close to him; he baptized Fiona and celebrated Elisabeth's First Holy Communion, and was very important to our family's faith life in general, so we were sad when he moved on to a different church this summer. I had such high hopes for this Irish Hiking Hat, but I was down to the wire on it (I knit it the week before Christmas, and really needed to finish it in about a day because of James's vest). The instructions said to pick up one stitch for every row around the brim, and although my instincts were telling me not to do it, I said, "The pattern must be right." Unfortunately, that was a terrible mistake. The hat turned out to be poochy and ugly. I felt bad even giving to him, but I just didn't have time to re-work it. (It does look a little bit better on an adult's head than on Elisabeth's small head, but not a lot.) So, that was a disappointment, although he was grateful and gracious, of course. This year, I have gifts to make for Father Kevin, and Father Peter's successor (and Father Peter, too, if I have time). I was thinking of doing scarves, but they are slower to knit than hats and take more yarn. And I'm realizing that I have less time to knit than I thought I would, because I got about 3 weeks behind on the Martinmas knits. Still, I have some scarves in mind, as well as a hat possibility -- a different "Irish Hiking Hat" -- for Father David (who we didn't know last year, so he didn't get a hat). I was also thinking of one of the scarves in the book One Skein, the longer but narrower one of the "Rib and Cable Quartet".